Romney, Obama, Jill Stein, or Gary Anderson: Whose policies are closest to yours? Which Presidential Candidate’s Views Are Closest to Yours? The Answer Might Surprise You. 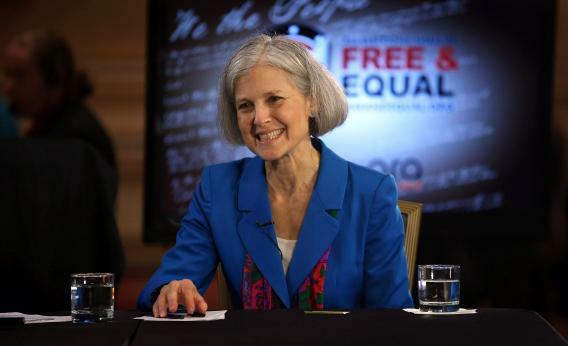 Green Party presidential candidate Jill Stein might siphon some votes from Obama if people voted purely on the issues. If you’re like most Americans, you’ve known for some time which presidential candidate you plan to vote for on Tuesday. Through all the debates, the flip-flops, and the gaffes, there’s a good chance you’ve never seriously questioned your choice, which likely coincides with your party affiliation. Perhaps your personal feelings toward the candidates played a role too. And of course there are probably one or more policy issues about which you feel quite strongly. But what if you had approached the election, from the outset, purely as a question of which candidate’s policy stances align most closely with your own views? Would you have settled on the same candidate? At least two websites, iSideWith and ElectNext, have developed online questionnaires designed to match you with your most ideologically compatible candidate. When I asked them what kind of feedback they’re getting from respondents, both sites’ creators told me the same thing: People are shocked to find out the extent to which their views dovetail with those of candidates they’ve barely heard of, much less considered voting for. Each site begins by asking you to take a stand on a series of issues relevant to the current election cycle, from abortion to gay marriage to the debt ceiling to intervention in Syria. After you’ve answered a certain number, you can press a button to check your answers against those of the candidates. The first thing you’ll notice is that there are more than two candidates. The second thing you’ll notice, if you’re like most people, is that you have a lot more in common with some of the third-party nominees than you realized. On iSideWith, the average respondent matched most closely with Barack Obama, holding 48 percent of views in common as of a recent tally. In close second, at 45 percent, was not Mitt Romney, but Gary Johnson, the Libertarian candidate and former New Mexico governor. And in third was Green Party candidate Jill Stein, at 39 percent. One reason for the surprising results likely has to do with the demographics of the people taking the quiz. It’s a safe bet that they skew young, idealistic, and socially liberal, which would go some way toward explaining the affinity for Obama, Johnson, and Stein. Even so, it’s clear that a lot of Obama voters are closer to Stein on many issues, and many Romney voters have a stronger ideological kinship with Johnson. The site’s co-creator, Taylor Peck, agrees. “Nationally what I’m noticing is that we’re getting a lot of respondents who come to our quiz who may side with Romney, but tend to be socially more libertarian than Mitt Romney is. And in the red states, we’ve noticed that Romney is losing a lot of ground to conservatives on economics and foreign poilcy.” Those who side with Stein, Peck adds, seem to favor her progressive foreign-policy agenda over Obama’s more interventionist tendencies. I tried both sites, expecting them to spit out Obama as my nearest match. Instead, both gave me Stein, by narrow margins. Johnson was third. How many people will actually go out and vote for these third-party candidates after using the sites is impossible to say. Most will probably shrug and cast their vote for the candidate they’ve backed all along. And that’s not necessarily a bad thing. After all, if voting were just a matter of selecting the person who agrees with us on every issue, we’d all just write in ourselves for president. For my part, I gave Stein some extra consideration based on my surprising iSideWith and ElectNext results, but I was actually more impressed by Johnson in last month’s televised third-party candidates debate. And while I admire both candidates for their ideological consistency, I don’t think that’s the most important quality in a president. Both Obama and Romney strike me as more likely than any of this year’s third-party crop to strike the compromises needed to keep the nation running smoothly. But if sites like these catch on and grow in elections to come, they could make for a mind-expanding addition to the often-monotonous election-year media mix. And by giving lesser-known nominees an equal platform on social media, they might provide more incentive for strong outsider candidates to enter the fray. Both sites are already reaching a lot of people. iSideWith has drawn more than four million responses, and ElectNext is nearing three million. I found iSideWith to be the stronger and more seamless tool for the current presidential election, perhaps because it’s human-curated, with its two creators doing the research to match each candidate with the appropriate policy stand. Of course, that also limits its scalability. Peck tells me that he and co-creator Nick Boutelier haven’t incorporated as a company or a nonprofit, and are just running the site out of mutual passion, with some support from Paypal donations. ElectNext, in contrast, is a for-profit startup that relies on data and automated algorithms to match candidates with their positions, with some corrective input here and there from human moderators. That allows the site to match users not only with presidential candidates, but with their candidates for Congress. Dannenbaum says her eventual goal is to reach all the way to local elections. In which case, perhaps you’ll find yourself backing a green for city council or a libertarian for district attorney after visiting her site in 2014.